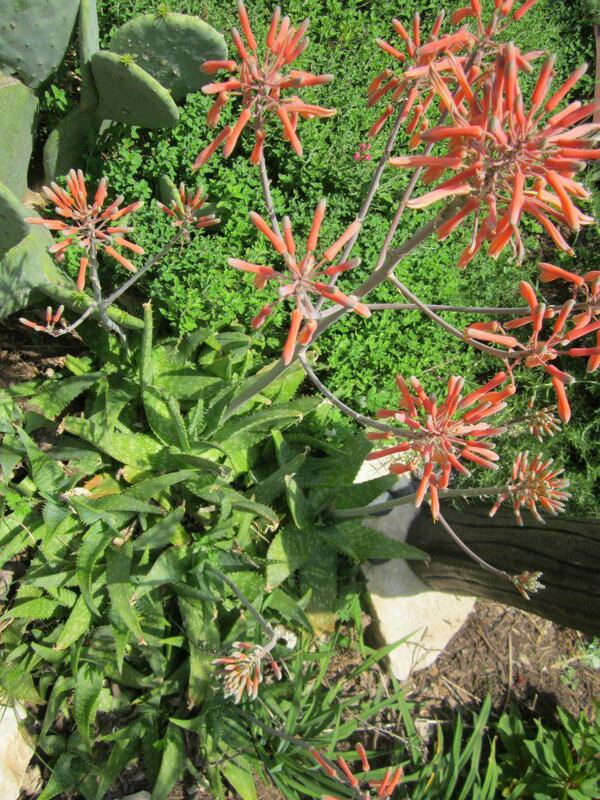 Aloe is a great landscape plant that is not only attractive but functional. The Aloe Vera family has over 300 species and has recorded uses that date back over 3500 years. While it is believed to be a native of South Africa, it has been highly valued for its medicinal properties and mentioned in the writings of the great Egyptians, King Solomon, Alexander the Great, the Orient and even the Bible. The Spanish Conquistadors transported Aloe from South America to Europe making it part of the foundation of Western medicine. Aloe Vera has been credited for being a cure-all for many ailments, and while our medical professionals only approve the plant for some products like skin care and laxatives, the flesh, salve and flower are believed to have many medicinal properties in many different cultures. Aloe is a perennial plant in the Lily family, though it lends itself beautifully to a succulent bed with Agave and Cactus. The Flowers range in color and size ranging from inches in height to several feet. The flowers are in shades of Pink, Yellow and Salmon/Orange. The leaves range from Grey to bright Green to mottled in color. The plant itself is striking. Both figuratively and literally. The upright rosette statuesque plant has long, thick, large fleshy leaves with a spiny margin and a spike at the end of each leave. This is not a plant you want to handle casually. The careful Gardener would approach the handling of this plant with good gloves and long sleeves. Aloe’s will produce many, many “pups” each year. The Mother plant puts out dozens of smaller plants around the base of the original plant. Each of these has its own root system and if they are carefully removed from the Mother, they can be transplanted immediately without any shock. This is also a great opportunity to share with other gardeners, or trade for new Aloe’s or succulents. Aloe’s prefer Sun to part shade. They like reasonably good, well-drained soil and require very little water. It is important to plant your Aloe’s in a relatively protected area as they can be damaged in a hard frost. You can protect your Aloe’s with a frost cloth or bucket. Watering them well before the frost to help keep the ground temperature warmer can help keep the roots from freezing. You may lose some of the top plant but the Mother will protect the pups. The root system will usually recover and put out new plants if the frost damage isn’t too severe. If your Aloe is in a pot, never leave water in the saucer before a freeze or the Aloe will burst and die. Try adding an Aloe to your landscape next season, you will be amazed by how lovely and functional a plant it really is. Google some of the many websites that provide the medicinal information. The uses are endless.